BCE constitutes the requirements from ISO 22301, which allow various departments of your company to provide a practical framework for setting up and managing an effective business continuity management system with less guidance from management - without putting in risk the fundamental ideas behind the ISO 22301 framework. 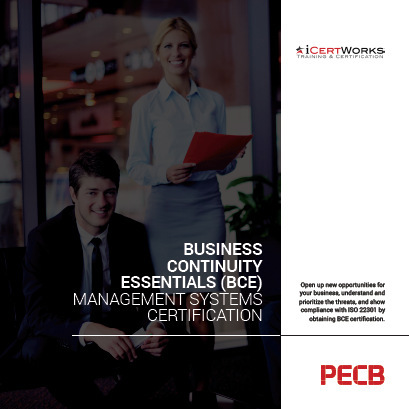 Implementing the PECB's BCE framework and obtaining the certification for your organization, provides to your partners and customers the assurance that you have the ability to continue operating during adverse conditions, giving them peace of mind that you are a reliable supplier and can address the challenges involved in an efficient way. BCE certification (also known as "registration") is granted by a third-party, such as PECB, upon verifying through an audit that the organization has fulfilled the considered essential clauses. This certification is then maintained through scheduled annual surveillance audits by the registrar, with re-certification of the Business Continuity performed on a triennial basis. For more information on BCE Certification, please fill out the form on the right side of the page. Contact us about BCE Management Systems Certification! Looking for ISO 22301 Certification?